The day before Lent begins is called Pancake Tuesday or Shrove Tuesday. Shrove Tuesday is so called because it is the day your sins are forgiven or shriven, but it is more commonly called Pancake Tuesday. This year is falls on 5th March. 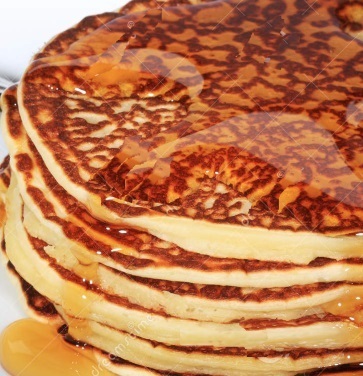 The connection between pancakes and Shrove Tuesday dates back to when fasting in Lent was strictly observed. Meat was banned and most Irish families ate only one small meal per day, probably potatoes, without the usual butter and milk! Making pancakes provided the opportunity to use up the households butter, eggs and flour. The actual tradition of mixing them up for pancakes is thought to come from a pagan ritual, but others say it is a Christian tradition - with each ingredient representing one of the four pillars of the faith. Eggs for creation, flour sustenance or the staff of life, salt for wholesomeness and milk for purity. Pancakes have been around for centuries as a favourite staple in many cultures’ diets. They began over 30,000 years ago during the Stone Age. Researchers have found pancakes in the stomach of Otzi the Iceman, human remains dating back 5,300 years. Pancakes exist all over the world and it seems that each culture has its own unique take on them. They are served for breakfast, lunch, and dinner all over the world : French crepes, potato latkes, Irish boxty, Scotch pancakes, Russian blini, Welsh crampog, Indian poori, Hungarian palacsinta, and Dutch pannenkoeken are a few of the variations. They can be sweet or savoury. Even in the UK there are some variations. For example Welshcakes, or light cakes are eaten in Wales while many pancakes in Gloucester are made with suet, a hard, white or pink fat made from beef or mutton. I grew up with sweet pancakes. Mum would make the batter and leave it stand for an hour in the fridge Then a good ladle of the batter was put into the pan and flipped once, and then covered in sugar and lemon juice and rolled up. My Mum used to save them in the oven. When I got married and I made them for my family, it was hard to keep up with the demand! The pancakes disappeared almost as quickly as they were made. 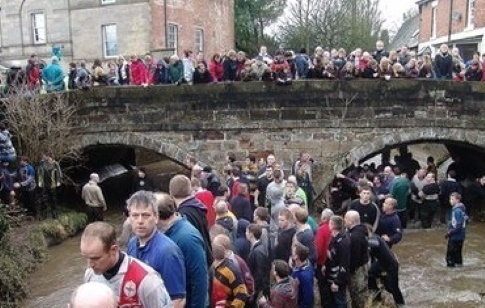 There is also a tradition in some places to have pancake races. People race to the finish, flipping pancakes on a frying pan as they go. The winner is the first to the finish line with a pancake. The Olney Pancake Race is held at Olney in Buckinghamshire on Shrove Tuesday. It is one of the best known pancake races in the United Kingdom. The course for the Olney Pancake Race is about 415 yards long (about 379 meters). Competitors must wear traditional costumes that include a skirt, apron and head covering to run the race. Each contestant has a frying pan containing a hot pancake. They must toss it three times during the race. The first person to complete the course and arrive at the church is the winner. At Westminster School in London, the annual Pancake Grease is held. A verger from Westminster Abbey leads a procession of boys into the playground where the school cook tosses a huge pancake over a five-metre high bar. The boys then race to grab a portion of the pancake and the one who ends up with the largest piece receives a cash bonus from the Dean. In Scarborough, Yorkshire, on Shrove Tuesday, everyone assembles on the promenade to skip. Long ropes are stretched across the road and there maybe be ten or more people skipping on one rope. The origins of this custom is not known but skipping was once a magical game, associated with the sowing and spouting of seeds which may have been played on barrows (burial mounds) during the Middle Ages. Many towns throughout England used to hold traditional Shrove Tuesday football (‘Mob Football’) games dating back as far back as the 12th century. 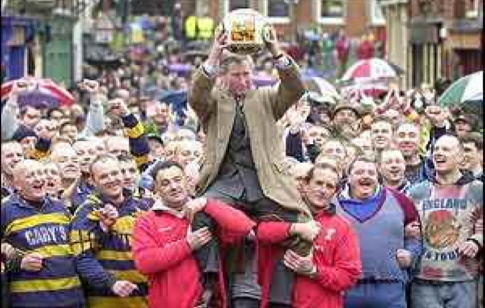 The practice mostly died out with the passing of the 1835 Highways Act which banned the playing of football on public highways, but a number of towns have managed to maintain the tradition to the present day including Alnwick in Northumberland, Ashbourne in Derbyshire (called the Royal Shrovetide Football Match), Atherstone in Warwickshire, Sedgefield (called the Ball Game) in County Durham, and St Columb Major (called Hurling the Silver Ball) in Cornwall. Ashbourne 2003 and Prince Charles throws the ball to start the Game between the Up'ards and the Down'ards. Mardi Gras is French for "Fat Tuesday", reflecting the practice of the last night of eating richer, fatty foods before the ritual fasting of the Lenten season. Many countries round the world have Mardi Gras celebrations and carnivals. Some of the most famous are in Rio de Janeiro in Brazil, New Orleans in the U.S.A., Venice in Italy and Sydney in Australia. The Rio carnivals started over 250 years ago when the Portuguese settlers brought a form of carnival called 'entrudo' with them. It consisted of people throwing flour and water over each other! In 1856 the police banned entrudo carnivals because they were becoming violent and lots of people were getting hurt. This is when the carnival, like it is today, started, with large processions of people marching, singing and dancing. People taking part in the parade dress up in very bright exotic clothes. Sometimes the costumes are made on large wire structures so the people wearing them look very big, like butterflies or birds. There are big floats, with stands for singing and dancing on built into cars or lorries that take part in the parade, they are decorated as brightly as the people. So, whatever way you celebrate, enjoy your pancake feast. “Remember, man, that thou art dust, and to dust thou shalt return”. The ashes were be prepared by burning palm leaves from the previous year's Palm Sunday celebrations. Ash is used because it is a symbol of death, because all bodies turn to ash or dust in the end. Ash Wednesday is exactly 46 days before Easter Sunday. Easter is a moveable feast based on the cycles of the moon and falls on the first sunday after the first full moon after the equinox. This year Easter falls on 21st April so Ash Wednesday is on March 6th. The earliest date Ash Wednesday can occur is 4 February, The latest date Ash Wednesday can occur is 10 March. Ash Wednesday is the first day of Lent, the forty days which are designated days of fasting and abstinence preparing for Easter. The number forty had great biblical significance. The Israelites wandered forty years in the wilderness. Moses spent forty days on Mount Sinai. Christ fasted forty days in the desert. Late in the sixth century, Pope Gregory the Great set the pre-Easter fast at 40 days, excluding Sundays which were feast days. In Lent there used to be total abstinence from meat, eggs, butter, milk and animal fats. For breakfast, a family might have had a small meal of dry bread, or porridge, washed down with black tea - and then the same for supper. For their midday dinner, the meal was usually potatoes seasoned with fish or onions. Families living on the coast might also have had shellfish and edible seaweed for their dinner. In Lent no merry-making of any kind was allowed or tolerated. That meant no music, dancing, card games or even visiting with the neighbours. There were no marriages during Lent. Many people also gave up smoking as well as alcohol 'for the duration'. By the middle of the nineteenth century, the rigid austerities of the Lenten fast had been greatly relaxed so that the majority of Irish people observed 'the black fast'- one meal and just water to drink only on Ash Wednesday and Good Friday. There was also a welcome break from the long, sombre days to look forward to - the feast of St. Patrick on March 17th when there was a break from Lenten rules.